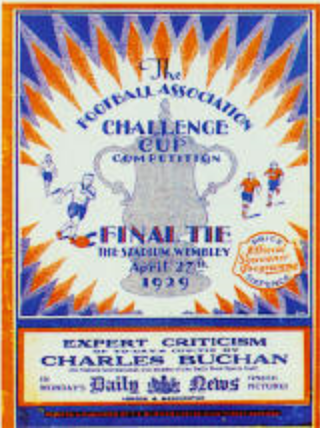 In 1929, pioneering firm British Talking Pictures Ltd went to Wembley and made a – talking picture! of the FA Cup Final. It was what Mitchell and Kenyon would have done, but by 1929 new tech chose other, newer vehicles. Considering its subject, this film is astonishingly early. You can watch, and listen, to the 11 minutes we have left at British Pathe’s site here. Isn’t it about time they allowed embedding? 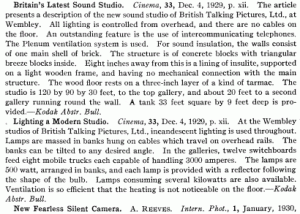 In October, a devastating fire would destroy both of British Talking Pictures’ existing studios, causing an estimated £100,000 damage – in 1929 prices. 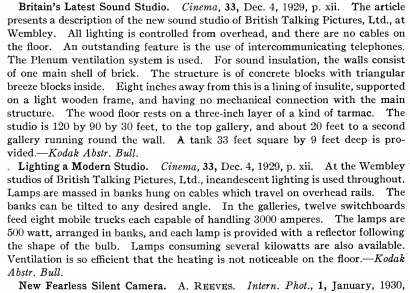 But the company survived and thrived, and by the mid-1930s was a leading supplier of sound equipment to cinemas across Britain. £800 (1930 prices) buys you all this! The recording itself is one of the very first made of an English sporting crowd. 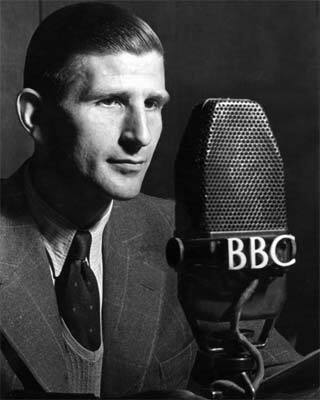 BBC Radio commentary was already up and running by this stage, and supporters can be heard on surviving recordings of these games. But this is the earliest uninterrupted recording that I am aware of, and certainly the earliest recording of the whole Wembley FA Cup ritual. And the ritual is all there, complete, in what is only Wembley’s seventh final. There is organized singing before the game, a Royal presence (the Prince of Wales, the future Edward VIII) and a brass band. But there is more to it: the proceedings end with God Save The King after the Cup has been presented. Note that the Bolton captain neither kisses nor raises the Cup when it is given to him: instead, he is chaired (somewhat awkwardly) around the stadium by Bolton officials and teammates. Much of the FA Cup ritual is revealed, here, to be war remembrance. Pack Up Your Troubles is sung with enthusiasm, as match programmes are waved. For Abide With Me , the band is hushed, and the conductor, all in white, turns and leads the crowd. It’s a slow, graceful, moving rendition. The Bolton team had been together for a decade, and this was their hat-trick of winning Wembley Finals. They’d almost all fought, in 1914-1918, as perhaps most men in the crowd would have done. Captain Jimmy Seddon had suffered trench foot. The Wembley Ritual is one of remembrance. In 1929, it was remembrance – and remembering: the recollections of real memories, of real absent friends. The Daily News had been C.P. Scott’s paper before the Manchester Guardian. As for Buchan, he was no pioneer as a player-turned-journalist: one of Everton’s founding players, Frank Brettell, made more money from writing than from playing. But Buchan went on to found the first sustained intelligent football magazine for boys, one which has become a Christmas favourite and a focal point for 1950s nostalgia. All that was a long way away in 1929. Herbert Chapman, writing at about this time, claimed that playing standards had fallen. What we see here is a mixed bag. There are some lovely touches, some excellent passes short and long, some great tackles, and even some decent keeping. 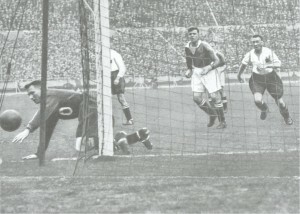 The careers of both sets of players straddled the 1925 offside law change – the goalscoring records of George Camsell and Dixie Dean are 24 and 18 months old as we watch – and some of the long-ball crudities that the change encouraged can be seen too. More obvious here than in film of later years is the emphasis on the dribble – an attacker taking the ball as far as he could before encountering a tackle, almost rugby style. This is an older echo altogether, of the football of the 1860s and 1870s, and that old man accompanying the Prince of Wales as the players are introduced would have seen it for what it was. Because he was Sir Charles Clegg.. Some members of the England eleven were awful snobs, and not much troubled about a “man fra’ Sheffield”. In 1923, Clegg had succeeded Kinnaird as FA President, and in this capacity the Prince of Wales was given over into his care for the day. What the incorruptible, teetotal old man made of his charge is unrecorded. Clegg was one of the great romantics at heart. Behind the flinty, no-prisoners facade was the soul of a young man who’d been driven out of his first love, athletics, by the corruption brought on by gambling. He’d fought the arrival of professionalism before tacking to the wind alongside Kinnaird and Marindin, and later fought both the infant Player’s Union and the breakaway Amateur Football Association. Clegg it was who led the 1905 investigation into corruption at Manchester City, from which dates the first great period of their Old Trafford rivals. Clegg was a tragic figure too, and not just because he lived to see the sport he had played for love become big business that used players for profit before spitting them out like spent cartridges before they were thirty. Not just because the Football Pools would become a feature of everyday life under his watch. That small, determined figure you see next to the Prince of Wales was in mourning. He had had two sons with his wife Mary. He’d been luckier than Kinnaird, who’d lost two sons to the War. But first William Clegg died, in 1927, and then, in the year of this Final, the other son, Colin. His wife would die in 1933 and he’d see out his last four years of life alone. On the other side of London, Herbert Chapman’s Arsenal were about to begin their astonishing dominance of the English game, something which would continue right up to the renewal of war in 1939. Chapman was the dominant managerial figure – the Bradman of his trade – until Busby, but the Bolton and Portsmouth managers were figures in their own right. Victorious Bolton boss Charles Foweraker was a one club man. He’d started out manning a turnstile at the brand new Burnden Park in 1895, and was there to see John Cameron score in the FA Cup Final replay of 1901. 1901 had been the first Final Pathe had filmed. 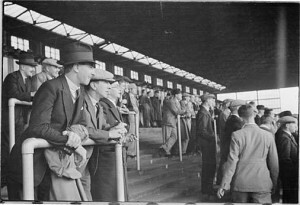 The initial tie at Crystal Palace had attracted 114,000 spectators, a record and a turnout that flirted with catastrophe. Catastrophe came shortly afterwards. But not in South London: it came in Glasgow,at Ibrox, and The Scotsman published the relieved, self-exculpating letters of Crystal Palace’s manager on successive days, a page or two from the accumulating lists of Glasgow’s dead. In 1914, Palace packed 120,000 in. That was enough: and after the Great War, the Final spent a couple of years in the safety of Stamford Bridge whilst Wembley was made ready. Foweraker had seen this great Bolton side win three Wembley finals in the stadium’s first seven years. For Jack Tinn, Portsmouth manager, and for Portsmouth themselves, it was all just beginning. Pompey had only been in the Football League for seven years, and were at the end of their second year of struggling in the First Division, Tinn’s first years in charge. Earlier in the season, they’d seen Leicester City put ten past them for no reply. But they’d survived, and would continue to do so. After one more losing Final, Tinn would lead a team to the Cup in 1939, and the trophy itself would spend the war under his bed. He retired in 1947, and a Portsmouth team most observers credit him with building would take back-to-back League titles in 1949 and 1950. Tinn would carry Portsmouth from the Great Crash to the Cold War, and leave them in an age of jet planes and nuclear brinksmanship. Despite the presence of Portsmouth, there is no chanting to be heard. The Pompey “Chimes” are Victorian – the words were printed in the official club handbook for the 1900-1901 season. Some writers think that the “Chimes” were a thing reserved for late in the game, at least to begin with, and as Bolton’s goals came on eighty and ninety minutes respectively, that might explain the chant’s absence. But what we can hear is a classic crowd “roar”, that undulates with play, and we can hear rattles. Thousands upon thousands of rattles – not vuvuzela-intrusive, but a pervasive rippling sound underlying the roar that one might easily mistake for applause. The crowd marks a good pass, or a fine tackle, with that astonishing roar – loud and low-pitched. But when the goals come, the note is higher, diluted, thinned-out by surprise and pleasure. And whether it marks good play or a score, the note is never aggressive – these are still George Orwell’s orderly English crowds, not the passionate fans of today with their talk of Scummers or Bindippers or Plastics..
Just knowing that this is 1929 is enough to make one want to send in helicopters, to winch the players and crowd to safety, away from the Crash, Great Depression, Manchuria, Munich and the rest. But this is the point about life: it’s not a lift you can step out from, when the floor you want arrives.. and within ten years England had lost two kings, and the fragile peace besides. 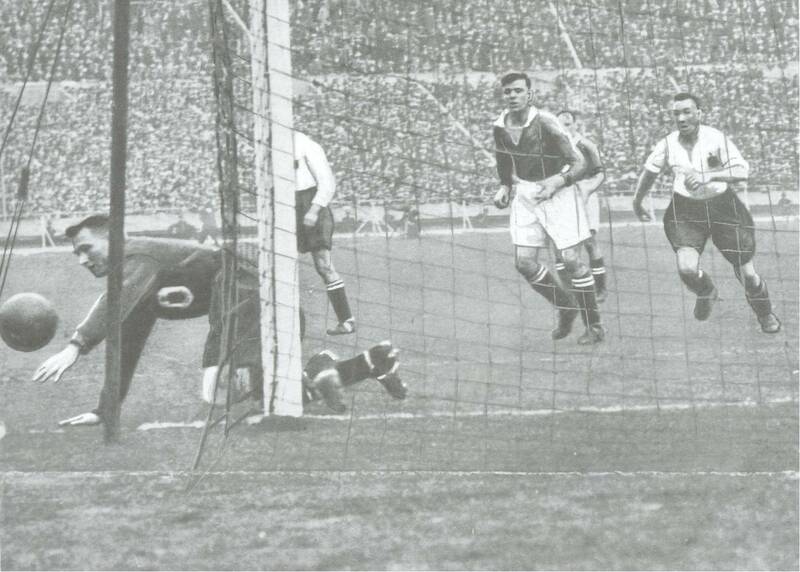 But, as we’ve noted, Jack Tinn was still there, at Portsmouth, in 1939, and sound film of Cup Finals, astonishing in 1929, was an absolute commonplace when he and his side came back and made it third time lucky. I spoke to Chris Bevan of BBC Online yesterday about the prospects for Aston Villa v Chelsea in Saturday’s FA Cup Semi-Final. Context gives the game unusual interest. Only two weeks ago, Chelsea thumped Villa 7-1. Scores of that magnitude just don’t happen to top-four candidates like Villa. Just about every other instance of a seven or more goal haul has featured a title candidate against a relegation certainty. Nor do scores of that kind happen to Martin O’Neill. It’s not what being Martin O’Neill is all about – nor is it what employing Martin O’Neill is all about. You can get 7-1 by employing more or less any manager you choose: you bring in O’Neill to prevent it. What’s more, the game is unusually important for both clubs. Villa really do need to reach Europe directly this season, in order to demonstrate the real on-field progress they have made in the last two years. The top four might be too much, but the FA Cup could be just 180 minutes away. Villa lost at Wembley in the Carling Cup Final, and the players will be desperate to get back. But Chelsea will want to win the double to make up for both the humiliation of Champions League defeat to Jose Mourinho at Inter, and the FA Cup is now every bit as important to the blues players, now on a huge roll, as it is to Villa. Chris’s post pulls in opinion on the game from far and wide, and includes my views on what options Martin O’Neill is left with against Chelsea. You can read the whole thing here.